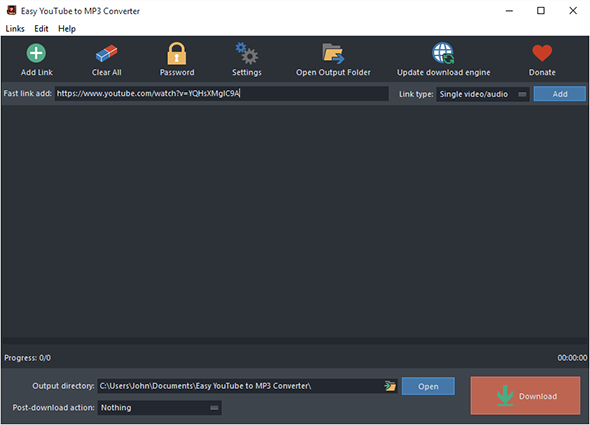 You find an interesting video from YouTube and you want to save/download it to your computer and later share it with your friend or keep it as a collection. However, by default YouTube doesn’t allow users to save/download the videos. It only allows users to send a hyperlink to friends and invite them to go to YouTube website to view the videos. It will become a problem because these video may gone forever due to copyright infringement issues, why not save/download the video before it’s too late? Enter the URL in the bar of “Fast link add”, then choose the link type from the dropdown menu of “Link type”, finally click “Add”. Import links from a text file: to import URLs from a text file directly, choose the text file containing URLs (one link per line) in activated window and then click “Open”. If you need to download videos from those sites which require logins, click “Password” and input the correct username and password in the activated “Username” & “Password” boxes, finally click “Add”. When the URL is added, you will see the links of all video formats from certain websites listed in the dropdown menu of “Format” along with the video thumbnail and details including resolution, codec, framerate, size, etc. 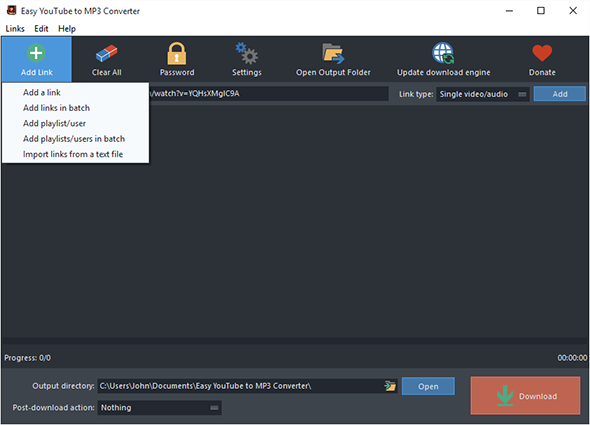 Choose “MP3” as the output format. In the menu of “Profiles”, choose the profile for the converted video. The built in previewer allows you to preview the video before download by clicking “Preview”. If you need to delete download tasks, click “Clear All”. Before download, click folder icon in the “Output directory” bar and choose an output folder to store the downloaded videos. In the menu of “Post-download action”, some actions can be automatically performed like “close the program”; “open output folder”; “shutdown PC/log off/restart”; “do nothing” when the download is complete. When everything is settled, click “Download” to start video download. You will be supplied with a progress bar and some details during the process. If there is a need to stop download, click “Stop”. Once the download is finished, you can find the downloaded videos by clicking “Open Output Folder” or “Open”. In order to avoid any download failure, it is necessary to keep the download engine up-to-date. Click “Update download engine” and in the activated window, hit “Get the latest version”. 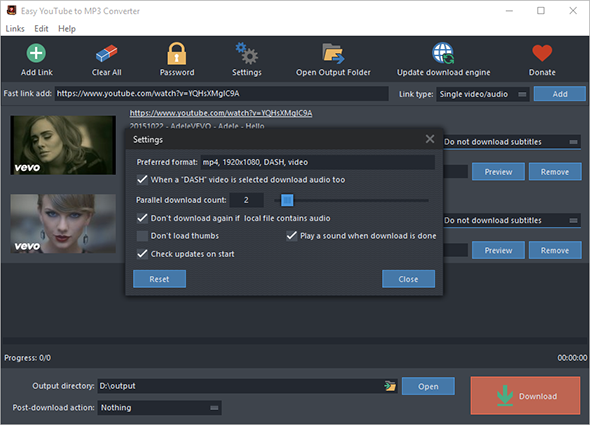 A few more advanced settings are provided: click “Settings” and in the popped up window you can set max parallel downloads; download audio when a “DASH” video is selected; don’t download again if local file contains the same video; don’t load thumbs; play a sound when download is done; check updates on start.